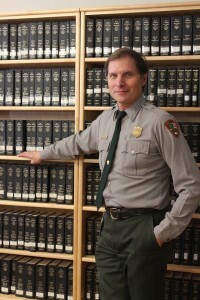 Scott Hartwig, who retired in 2014, served in the National Park Service for 34 years as an interpretive ranger and was a supervisory historian from 1993 through his retirement. He was and is one of the Service’s preeminent Civil War historians, combining the skills of a first-class historical researcher and writer with those of a born storyteller. As a historian, Hartwig has authored numerous articles, essays and books on Civil War subjects and has often talked about Civil War topics – including the Battles of Gettysburg and Antietam – on the History Channel, Discovery Channel and Pennsylvania Cable Network. He was the author of a noted work on the latter, entitled To Antietam Creek: The Maryland Campaign from September 3 to September 16, and is working on a second volume on that campaign. He was also a co-writer for two Telly Award-winning educational broadcasts, Gettysburg: The Soldiers’ Battle and Gettysburg: The Face of Battle. Hartwig’s other works include A Killer Angels Companion (a guide to the book of the same name on the Battle of Gettysburg) and Gettysburg: The Complete Pictorial Of Battlefield Monuments. He has also been a contributor to other Civil War works. As an interpretive ranger, he has led numerous tours of the Gettysburg Battlefield for groups ranging from visitors to historians to soldiers from West Point and other military organizations. His exceptionally gifted work as an interpreter led to the receipt of Northeast Region’s Freeman Tilden Award for excellence in interpretation. He was a key player in the growth of Gettysburg’s on-site interpretation and living history programming, distance and satellite education efforts, and the design of all aspects of Gettysburg’s new state-of-the-art museum and visitor center, which opened in 2008.